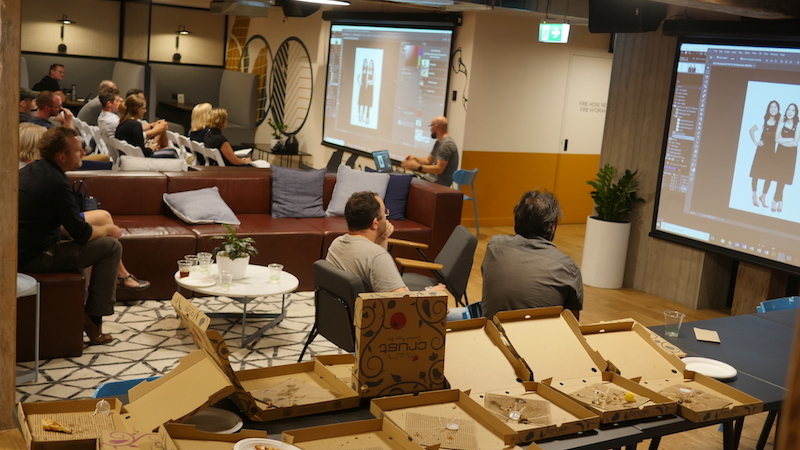 Australian Screen Editors and Adobe Video User Group (AVPUG) got together on Wednesday 28th of February 20018, for an inaugural hookup, held at Carve and Stitch in Pyrmont. 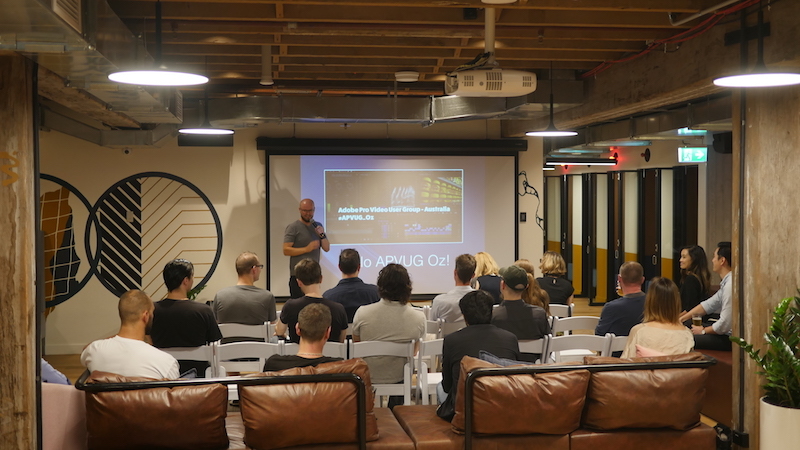 The session kicked off with Jon Barrie introducing this first AVPUG Sydney ASE hookup, (one was held in Melbourne last week), which we hope will become regular sessions. Paul Murphy was introduced and ran through how he had used the Premiere editing application from its early days and the effect it has had on his career . He showed us a screenshot of the application from when he was using it in 2002- quite unrecognisable from what it is today-it looked very clunky indeed! He explained how he cut his first feature documentary ‘Red Obsession’, a feature documentary about the rise of the wine connoisseur in China and the effect on global wine sales. (He managed to get some very reasonably priced top notch wine as a result!) This documentary won an AACTA award for Best Feature Documentary in 2013. After visiting Tribeca, Paul fell in love with New York and moved there just at the time that Premiere Pro was taking off, and managed to score some great training gigs as they adjusted to the new system. He has managed to find some solutions to tricky situations and is particularly interested in sound so he began by doing some training videos which led to doing a series of Lynda training videos. (Nice to hear an Australian voice!) His training led to editing work with Comedy Central, and now he's back in Australia to do a follow-up documentary on the wine industry. After this glimpse into Paul’s career, we all took a break to have a chat and eat yummy scrummy local pizza. People were not shy in introducing themselves, which was great, so it was a good networking opportunity. We then kicked into some more technical discussion and the questions flew - about working with multicam over networks, the delivery of merged clips. (Don't do it! you will lose your source reference time! Always multiclip your rushes and flatten your video for export.). There was some sneaky discussion about how to open the developer's interface to access merge clips, but I think you had to be there to truly understand how to do that! There was discussion about how AAFs lose metadata so OMF exports are best. So after this bit of Q&A we launched into demonstration of MOGRTS (just learnt a new word! it means "motion graphics templates") by Jon Barrie. Jon explained that Premiere Pro can read After Effects comps which are encapsulated with a locked down design – for example, straps or banners that indicate "coming up next". So it would be a basic template that allows a few minor adjustments which the Editor can make, such as changing a word like 'Monday' to 'Wednesday', changing the colour of text, changing an image within the banner, scaling etc, but the overall template would remain the same, giving a consistency when multiple people are working on a series. Handy hints were scattered throughout the discussion, such as in your timeline, “shift click” on your audio tracks will select all audio, “shift click” on video will select all video, “ alt (or “Option” on mac) click” on M will mute all tracks, “ alt (or “Option” on mac) click” on S will solo all tracks! Very handy. Jon then showed is the ins and outs of opening multiple projects at once which is a real bonus. 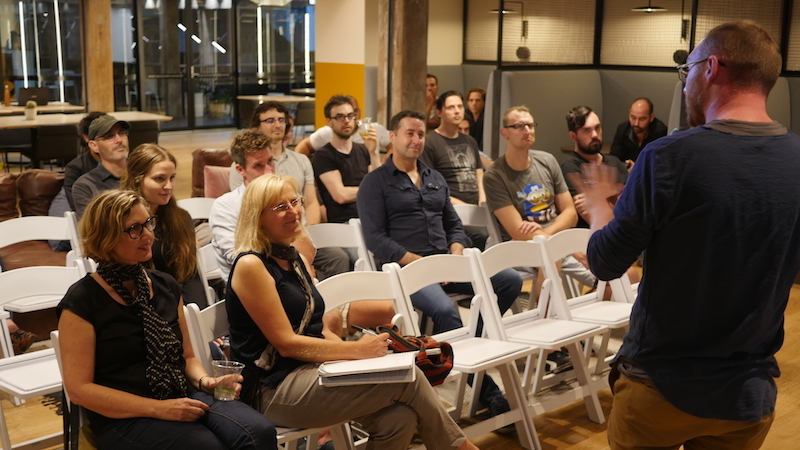 He discussed the feature film workflow, creating shared projects which allow you to minimise the size of your project file and break down the process. When you open a new project it creates what appears to be a bin in your project which actually contains the sequence and shot information of a selected project that you've opened. Refreshing the project will update it when an assistant is working on it - you can lock the project so that others can't access, or unlock it so that others can make changes. There was a question regarding ingest, and Jon showed us how we can go into the project settings and copy/ transcode/create proxies or copy and create proxies even after the project has been set. It was fascinating to watch how you can very quickly toggle between proxies and original footage, and how on export, the footage will automatically export the full resolution (unless it's not accessible on the drive). Jon suggested that you should store your proxy and my media on separate drives to enable flexibility. Another handy hint was to use "previews when rendering" to speed up the process during the edit. The session continued way past its allotted time, ending with more chat, beer & cider, then Jon diving back onto his computer to answer specific questions from those who hadn’t got to them in the main discussion. Thank you Andy Kristiaman for offering the fabulous venue (with beer & cider on tap! ), and Jon for providing the pizza, Paul Murphy for showing us your career path, and to Paul and Jon for your technical wizardry.